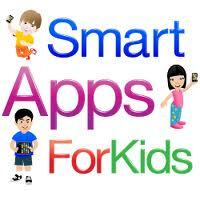 I just found a great new review site called Smart Apps for Kids. This is an easy to navigate blog that includes a free app of the day section, as well as top 10 lists: Editor’s picks, Free and Reader’s picks. You can also limit by age group- I like how they separate out toddlers and preschoolers, though toddlers are defined as 1-3 (the American Academy of Pediatrics would say that children under the age of 2 should’t be looking at any kind of screen at all). The site’s goal is to “to be the most complete source for parents and educators looking for info on an app before a purchase,” and they do offer honest positive and negative reviews for iPad/iPhone apps, as well as a star-based rating system. You can see what they’re up to via facebook, email, RSS or Twitter. Check out their facebook page for other review sources- they’ve “liked” a number of good ones. Posted on March 22, 2012, in Apps, Review Sources and tagged Review Sources. Bookmark the permalink. Leave a comment.